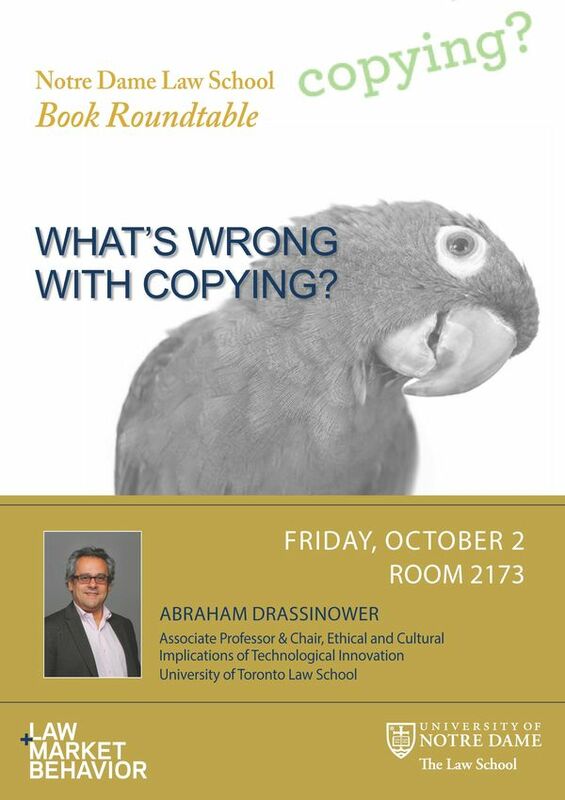 Some of the world’s leading copyright experts will meet on Friday, Oct. 2, 2015 to discuss Abraham Drassinower’s provocative new book, What’s Wrong with Copying? Drassinower is the Legal, Ethical, and Cultural Implications of Technological Innovation Chair at the University of Toronto Faculty of Law. The discussion is being hosted by Notre Dame Law School’s Research Program on Law and Market Behavior (LAMB). This is the fourth roundtable LAMB has sponsored on a new intellectual property book. “This is a great format for taking a really deep dive into some of the best ideas in our field. Our goal is to bring together some of the best IP scholars to really engage a topic in a way that is hard to do when everyone is presenting a paper. And we’re also trying to create a community of people who are studying books rather than just law review articles,” McKenna stated. Drassinower, who has also published writings in the areas of charitable trusts, unjust enrichment, intellectual property, and psychoanalysis and political theory, will attend the roundtable to discuss his ideas more thoroughly. Shyamkrishna Balganesh, Professor of Law at the University of Pennsylvania Law School. Rebecca Curtin, Assistant Professor of Law, at Suffolk University Law School. Peter C. DiCola, Professor of Law and Searle Research Fellow at Northwestern University School of Law. Nicole Garnett, John P. Murphy Foundation Professor of Law at the Notre Dame Law School. Wendy J. Gordon, William Fairfield Warren Distinguished Professor at Boston University School of Law..
Laura Heymann, Vice Dean and Professor of Law at William and Mary Law School. Amy Kapczynski, Professor of Law at Yale Law School and faculty director of the Global Health Justice Partnership. Glynn S. Lunney, Jr., Professor of Law at Texas A&M University School of Law. Michael J. Madison, Faculty Director of the Innovation Practice Institute and Professor of Law at the University of Pittsburgh School of Law. Mark Rose, Professor of English at the University of California, Santa Barbara. Pamela Samuelson, Richard M. Sherman Distinguished Professor of Law and Information at the University of California, Berkeley. Jessica Silbey, Professor of Law at Northeastern University School of Law. Christopher Sprigman, Professor of Law at New York University School of Law. Rebecca Tushnet, Professor of Law at Georgetown Law. Stephen Yelderman, Associate Professor of Law at the Notre Dame Law School. Originally published by catherine behan at law.nd.edu on September 30, 2015.